Leaving behind the hype and buzz of their ARIA-nominated debut, the long awaited second album from Sydney’s Spit Syndicate is the continuation of the duo’s growth as tastemakers in Australian hip-hop. 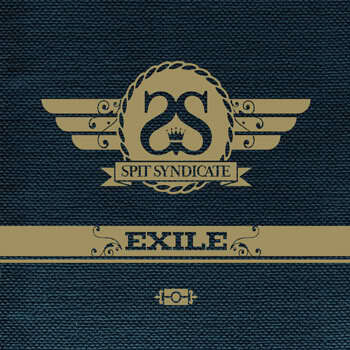 After a hiatus dotted by real life, touring and overseas travel, Spit Syndicate return with Exile; a rich, progressive sophomore album replete with groove, substance, and the pair’s trademark sleek aesthetic. Inspired by the clarity of mind borne out of travel, the feeling of suffocation by one’s everyday surroundings and the displacement sometimes required to get right, Exile invites you to a world away from the mundane and uninspired. It pits the listener against the surrounds of comfort and familiarity and supplants it with thrill, excitement, and flirtation; evoking ideas of escape, both physically and mentally. Nick Lupi (22) and Jimmy Nice (23) have carefully crafted rich, textured songs; catchy melodic lines woven with the lyrical dexterity for which the duo are widely regarded. The pair move seamlessly between self-reflection, triumphant flexing, vivid story-telling, and bleak yet poignant observation, displaying an acute awareness of the road in front of them and the world around them. The journey is buoyed by the album’s soulful yet ultimately banging production, the bulk of which is handled by Adit (Horrorshow). Adit lends his prodigious talent as the album’s executive producer, resulting in a polished, cohesive body of work: epic yet delicate grooves, live instrumentation and slamming drums. Superproducer M-Phazes also contributes to Exile, as do rising beatsmiths JSquared (Melb) and Cam Bluff (Bris). Guest vocalists are restricted to Spit Syndicate’s One Day family; the freakishly talented Solo, the ever-so-soulful Joyride (Spit Syndicate’s DJ) and the divine Sarah Corry provide layered, warm and sometimes haunting vocals on Exile. Touted by hip-hop heads and legends alike as a group to watch when they burst onto the scene, Spit Syndicate display a level of growth in Exile which proves that such praise, hype and expectations were not misplaced. Fresh after taking their notoriously high-energy live show around the country on the wildly successful Inside Story national tour with close friends Horrorshow, Spit Syndicate are poised to take the listener into exile.